Well, whadaya know? 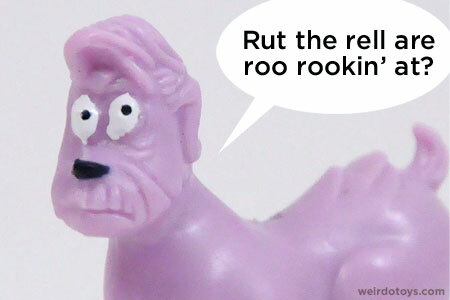 Another whole year of weirdo toy blogging has gone by. I don’t know what I expect you to do with that information. I usually try not to get too personal here on the blog. I just wanted you to know, there have been distractions lately, and I’m not neglecting you all or the blog intentionally. You know what? What the hell. Maybe I’ll get even more personal. 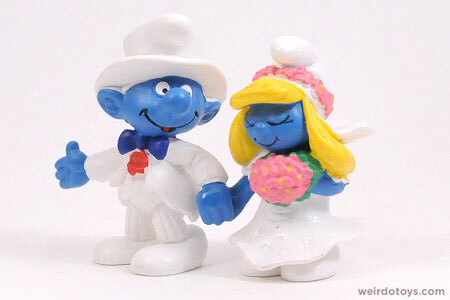 Here’s a pic of me and my bride-to-be, Nadine. She’s no weirdo toy lover, but she is cool enough to let some toys sit atop the wedding cake. Alright, back to the giveaway. Not much has changed on the blog at a glance. I’ve continued finding cool weirdos here and there, photographing them and writing about them as usual. One major evolution for Weirdo Toys this year has been its steps into the social media realm. First is the Twitter account. I have to admit the Weirdo Toys twitter account has really grown on me. It’s been great fun and such a great opportunity to connect with fellow fans, bloggers, toy lovers, designers, musicans, etc. I’ve made some great connections and have made some good “virtual” friends all while writing in 140 characters or less. 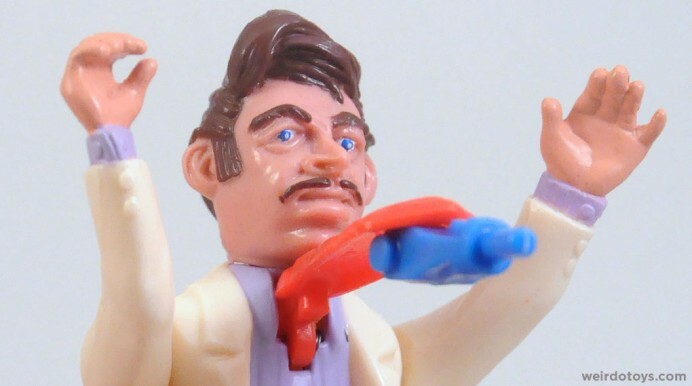 It’s also allowed me an opportunity to share other toy finds that never really make it to the blog, so if you’re not following Weirdo Toys on Twitter, you’re missing out. It’s not the end-all be-all that some make it out to be, but it is a fun little social circle if you’re not on there just spamming everyone. 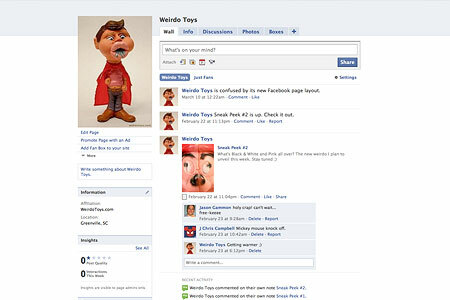 Secondly, I also started a Facebook fan page for Weirdo Toys. Unfortunately, no one is really using it (including myself), so it’s just kind of a weirdo ghost town right now. I do send alerts to the fans when I update the blog, so that could be useful I guess. Let’s see. Another thing I did a few times was the Weirdo Google Searches which people seemed to enjoy. It was kind of pathetic for me, because for a while there, I was posting those lists more than toys. I still find them pretty entertaining. I just pulled back on them for a bit, because there wasn’t enough toy activity to have me blogging every couple of weeks about weird keyword searches. I do have a visions for those searches though. Maybe some day I can put them on t-shirts or something. Oh yeah, that reminds me. 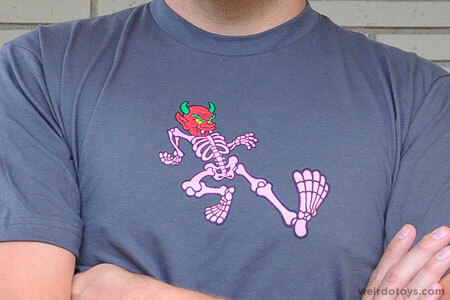 This year also marked the first item for sale on the blog – the Apple Devil T-shirt that everyone claimed to love until I produced them… then no one was to be found. Tsk, tsk, tsk. And now, the part you’ve been waiting for – the giveaway. As I did last year, I’m giving away the toy I posted yesterday, which is the Charles Bronson wannabe, Mr. Sleaze, and his dog, FooFoo. You get the toys, the package card and the separated bubble. Not only that, but I’m throwing in an Apple Devil T-shirt! So, if you answer these 3 questions in the comments form, you’ll have a chance to be the proud owner of a new weirdo toy and t-shirt depicting one. How’d you discover the Weirdo Toys blog? What are your favorite (or least favorite) parts of the blog and why? What would you like to see on the blog (like downloads, discussion boards, etc.)? Next week, I’ll pull one of the commenter’s names at random and announce a winner. Be sure to include a valid e-mail address, because if I can’t get in touch with you, you’re S.O.L. 1. I think the site got a mention on Boing-Boing, and I subscribed to the blog from then on. 2. Favourite parts of the blog are defo when you get a new (old, wierdo) toy and deconstruct it and what it reminds you of along with some nice pics and witty comments. Least favourite… em… I’m subscribed as a fan to the facebook site but like you mention above, you don’t really use it for anything. 3. Downloads would be good, I like your background on twitter so some downloadable pictures similar to that would be nice. Also you’ve a good knack of posing the toys so maybe some pictures with toys posed in way that makes them work well/funny as a desktop background so we could use them as our backgrounds in the office. 1. I found you from the great PhilipJReed on Twitter. Saw his tweet about you and had to check you out. I am also going to start following you. 2. Dont have a favorite or Least favorite Since this is my first time here. But I do enjoy the little bit of personal input you leave and the pictures of some really weirdo toys I would have never Know about. 3. Discussion boards are a good thing. Get people together with a common interest. I am going to float around and check everything out and see if there is something else I would like to see on here. So far I like what I am seeing. 1. I think I found you on Twitter, via a #FollowFriday. 2. I love the photos of the toys that you take. You should totally make a Weirdo Toys coffee table book! 3. Downloads would be cool. Maybe some desktop wallpapers? Also, maybe some video reviews of the Weirdo Toys. 1. I found your site when I was doing research on Ooze it (Great toy btw). 2. My favorite part is the amout of post. My least favorite part. You get tons of cool stuff and I don’t. 3. Downloads. I’m not a fan of discussion board so I wouldn’t go but I’m sure a lot of your readers would like that ! 1. I found your site through Google Reader recommendations. I have added it to my “Can’t miss” list since. 2. I enjoy just the the fact that you do find the _weird_ toys as advertised. It is also interesting to see how I may recognize where they came from in the end. And, as Mick pointed out above, you have good witty comments during toy deconstruction. 1. I actually found the site through Twitter. @TheSurfingPizza was following me, and I saw he was following you, and I was intrigued. 2. The fact that it exists. I’ve always liked knockoff toys and toys that just looked weird and “wrong,” so this site is pretty much a Godsend. 3. Honestly, I dunno, I think the place is pretty good as it is. 3: See #2. I also like the idea of desktop wallpapers. Also… congrats on the upcoming nuptials. 1. Oddly enough one day I happened to Google “weird toys”. I’ve always been a fan of oddball and knockoff toys, and that eventually led me here. 3. Forums would be a neat addition, but more of a bonus than something that is lacking. More weird robots perhaps, though I’ll enjoy anything you put up. I don’t want to be entered in the contest, so that someone more deserving can have a chance to win the grand prize, but I just noticed that Weirdo Toys and Surfing Pizza has the same blog birthday, September 15th. Your blog inspires me to strive for weirder things. It’s really great to hear what you all think and where you come from. Thanks for taking the time to share your opinions and ideas. I really hope to make this next year even better for the weirdo toys community. Also, @the pizza – Happy Blog Birthday. What a funny coincidence. 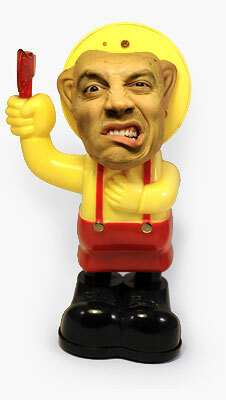 Last year I randomly used google to search engine bootleg toys and odd toys saw Weirdo toys and bookmarked it since. The best part of the blog is how it describes odd toys along with the owner replying to each responce in the blog.It enhances the awearness of knockoffs and bootleg ownership among we the followers of the site. Discussion board would be sweet on the blog. I worked with you on lots of amazing stuff for which you dominated incredible designs. Best part of the blog is knowing that I have held some of the actual featured toys. Discussion board is such a good idea. I found you as i was genually searching for Weirdo Toys! the first post i found was the one about the hunchback horror figure, and fell in love with the sight straight away as he and the other horror figures were some of my child hood Favorites! Best part of the blog is very similar to my first answer, becasue i com eon here, and find either the stuff i had as a child, or the stuff i wish i had as a child! you find some amazing figures on here, and your photography is always sharp as hell! Discussion board is a great idea…something i Would definatly like to see, is a video or a collection of photos of all your weirdo toy collection on the shelf were they all sit, i bet they look very impressive together, and i bet you got a great collection tht would make a great set of photos, or a kool edited video! 1. Through Poe Ghostal on Twitter. 2. The toys themselves. It’s fun to see what crazy things companies have made, and reading your comments on them. 3. Honestly, more posts! You could perhaps have some sort of guest posts. Let other people talk about weird toys they have. there is no doubt in peoples minds just how much you love doing this. That is the best part for me. Good luck on your Wedding coming up and I hope your fan base grows even bigger then it already is. It’s a fun blog with some funny, witty coments by you as well as the people that leave comments. 1. I found your blog via a mention of philijreed (battlegrip.com) on twitter. 2. The best about this site? The toys themselves are a treasure trove but your commentary really adds to it. I just found the blog yesterday but it’s so much fun browing through the old reviews. 3. No discussion board or other gimmicks. Just keep posting about weird toys. Twitter is already quite a fine extension to this site. 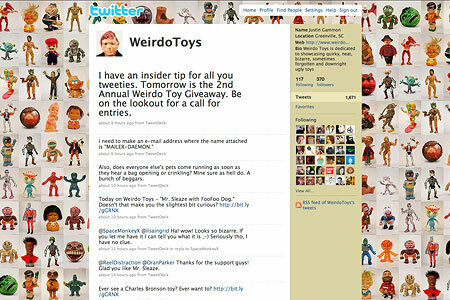 1-How’d you discover the Weirdo Toys blog? I can not remember! Maybe through another website? 2-What are your favorite (or least favorite) parts of the blog and why? 3-What would you like to see on the blog (like downloads, discussion boards, etc.)? More updates, and a chance to get some of these toys! Maybe you could have guest contributors! Like me! 1. I discovered the blog when trying to find information/coverage of the Allentown Toy Show, only to discover that one picture featured my father! Despite the freaky circumstances, I started reading more about Galoob’s Inspector Gadget (which I have) and the Madballs Head Poppin’ Action Figures (which I oh so desperately want as a set), and I’ve been hooked ever since. 2. Favorite parts of the blog: Honestly, I like it all, but I’m a real fan of obscure stuff. I’m interested in learning about action figures and toys in general, and the reason this site keeps me coming back for more is that I’m learning a lot of new things. Bootlegs are fantastic, too. But frankly, if it’s covered on another website (i.e. it’s something new that a lot of nerds are buying up right now), I’m not as interested. 3. Another blog I follow, Poe Ghostal’s PoA, takes guest submissions, and I think perhaps you should consider this. Obviously, they have to be well written and fit with the theme of the website, but it could allow for more frequent updates (you know, to fill in during the marriage/honeymoon void) and perhaps making this website a one-stop destination for all things of a Weirdo Toys nature. 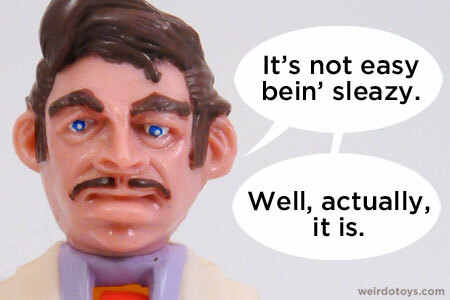 By the way, if by some miracle I’m chosen, I’d be willing to give up the Mr. Sleaze figure to another reader of the site, since I already own one. 1. I foudn the blog thru Google Reader recommendations. 2. My favorite part of the blog is your writing style, because it always puts a smile on my face. And this giveaway is also pretty cool! 3. I think Guest Posts would be cool to help the blog update more frequently. thanks, and keep weirdo toy updates coming, this sight rocks! 1. I started out reading your blog through the Superpunch and boingboing blogs that linked to you, now I come here on my own. 2. The best part is just seeing all the crazy toys I never new existed, they sometimes remind me of wierd toys I had (or saw) when I was a kid. 3. I’m not big on discussion boards, what i would like to see is more updates. Maybe you could have one of your friends who collects toys too to be a co-blogger, and you remain editor. Im not sure if that would work, im don’t know a hell of a lot about how blogging works. Good luck with everything! 1. I found your blog via your Twitter account, through which you helped me ID my weird toy, apparently called Muck Man. Thanks again for that! 2. 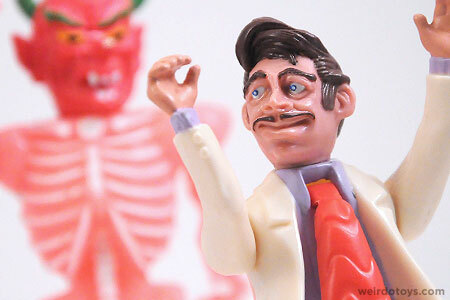 My favorite part of the blog is the fact that you include so many pictures of each weird toy. You are certain to get as many angles and details, and that’s great. 3. Oh, how about a discussion board for people like me who are trying to ID a weird toy they have? A place to post many photos together and where people can discuss what they think the toy might be? 1. Can’t remember what I was looking for but I found you through google images and seeing one of your weirdo pictures sucked me right in never to look back. 2. My favorite thing about the blog is that you are always really awesome about replying to peoples replies even if what they wrote doesn’t really warrant one you can usually see a little nod to a couple comments down. 3. i think downloadable material would definitely be a plus for this site. another fun thing that might give you the break you need and would be a positive for fans would be guest reviews every once in a while. 1. I found the site most recently via The Undiscovered Playthings, I think, though I’m sure I’d been here times before — probably thanks to Google searches for random bootleg toys. 2. The sheer wackiness of some of the toys you write about. These ain’t just bootlegs — they’re like melted bootlegs uncovered from a hole several kilometers from an alien crash site in Wisconsin. 3. Since you suggested it, downloads! Not sure what you could offer (printable paper versions of certain weirdo toys, like paper cube fake Madballs? creepy printable backdrops? weirdo toys desktops? ), but I loves me some downloads. 1. 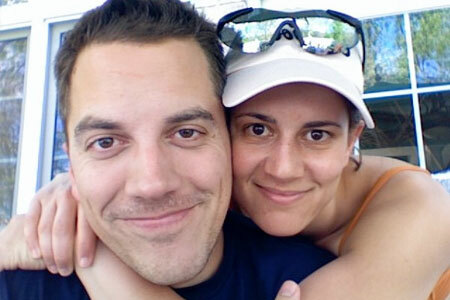 I found out about the blog from my very good friend, Eric Dodds. He told me about Weirdo Toys and what it was all about! 2. The excitement you get from a new toy that is found is one thing that is awesome about the blog/twitter page and how you talk about each toy. I get a good laugh with some of the sarcasm that you describe them with. 3. Some downloadable pictures of some top Weirdo Toys would be sweet; i know they would make a good desktop image for my Mac. 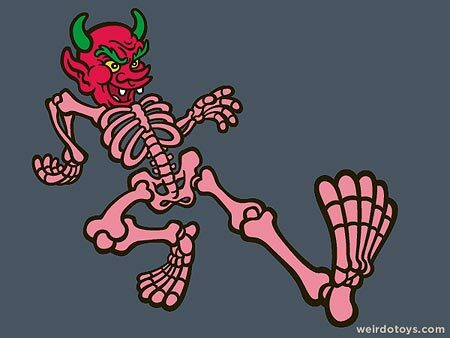 Anyway , is there a measurement guide for the sizes for the apple devil t shirt,eg shoulders whatever inches etc, I want to buy one. 1. How’d you discover the Weirdo Toys blog? results page while looking for a toy I wanted to collect. 2. What are your favorite (or least favorite) parts of the blog and why? want to collect the toys I see in the blog. I like the blog just the way it is now.